We can no longer recommend this product. After less than a year of normal usage, the sole has started to detach. I’ve reached out to Mahabis customer support team, and while they didn’t offer up a replacement pair, they did offer gift card towards another pair. But these aren’t cheap, and if these slippers won’t last me a year, then it’s not worth investing anymore money into. I have a thing for slippers. I’ve tried many different kinds, and none have really stood out as being one that I’d recommend. This ranges from $30 slippers from DSW to $100+ pairs from Ugg. None of them left a lasting impression. Then I found Mahabis by complete accident, and I was hooked. I wear slippers every single day, no matter the time of year or weather outside. It’s one of those things that’s a part of my daily routine; putting them on when I wake up in the morning, and when I first get home from work. I always step on the heel of my slippers. My wife tells me to buy a slipper without the heel, but sometimes want the heel. Later on I was chatting with a friend (in-person) about wanting a “convertible” heel slipper, which I’d never seen. Days later, I see a Facebook ad for Mahabis. It’s like they were in my head listening. Shortly after discovering the brand, I had to try them out. I opted for the Mahabis Classic dark grey pair (because grey matches everything) and a couple of their detachable soles (more on those later). When I first took them out of the box, they’re noticeably far lighter than any other slipper I’ve owned. Which is a good thing. The visual design of the slipper is very simple and sleek. 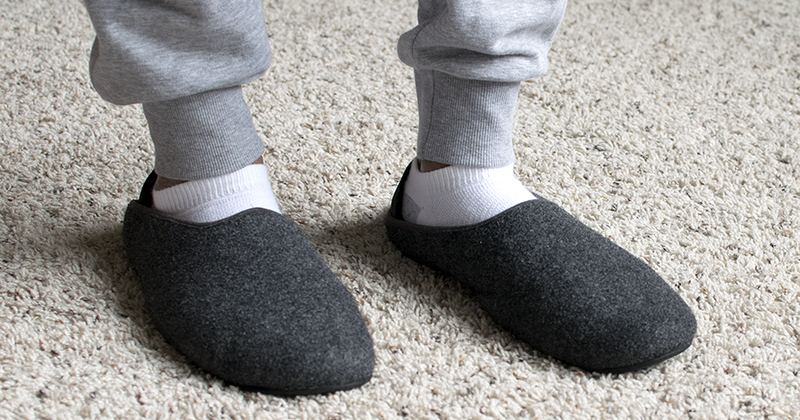 They don’t look like your typical old man slipper, which pretty much what all of my past ones have looked like. The slim silhouette of the slipper resembles more of a shoe than a traditional slipper. The outer shell is made of lightweight felt, with a neoprene collapsible heel…a feature I haven’t seen on another slipper before. The inside is made of sheeps wool, which I found was just the right amount to not cause overheating. I’ve been wearing these slippers daily for about two months now, and long past the honeymoon phase, these slippers have been well worth the cost. I wear them both with, and without socks and never have I felt that my feet overheat in them with the breathable fabrics. I generally tend to not wear them outside, just to ensure that I don’t decrease the lifespan of them. And after wearing them a while, you really appreciate the lightweight nature of the slipper, since I don’t really want it to feel like I’m wearing shoes around the house. Mahabis is very unique in two ways, one of which being they have detachable soles. The purpose of these is if you’re looking to do light outdoor activities with them around the house. And they snap onto the slipper via a button on the bottom heel, which keeps them attached to the sole. While they do come with pair, you can opt for additional ones for an extra $22 each. They come in a variety of colors. So choose whatever fits your personality. While I think the detachable soles are a great feature, I don’t find myself using them often. By the time I think of something to do outside, and then take time to change out the sole, it’s just easier to swap the slippers for a pair of shoes. This is the reason I bought these slippers. They’re functional in a way that all of my past slippers weren’t, by design. The neoprene material makes it super easy to choose which way you want to wear the heel. One concern I had about the collapsed heel was how it would feel under my foot when walking on it. In other words, would it feel like there’s a huge chunk of cloth under my foot to make for uncomfortable walking. But this has not been the case. In fact you hardly even feel it. The heel is thin enough to be very comfortable and unnoticeable when collapsed, and thick enough to not feel flimsy when raised and covering your heel. Quick tip/downside: I would recommend against wearing loafer/no-show socks with the heel up. When walking, it will pull the sock down off of your foot, and it’s very annoying. All in all, this is a great product that exceeded my expectations. They’re super comfortable and look really good. The price point isn’t the greatest, as most people don’t feel the need to spend $86 on a pair of slippers. I’m willing to pay a premium on something that fits my exact needs and has a lot of usage for me, so this fell in to that category. As mentioned earlier, I’m just not into the detachable soles, so I don’t see myself buying more of those. If you do decide on buying a pair, they fit big from what I’ve experienced and read online. So think about sizing down a size. Check them out if you’re in the market. We recommend them.